Past the House of Clutter. April 1, 2014 Unsure "Adult"
Yes, we are past the house of clutter stage. We are now to the cluttered house stage. 2.5 years ago, we were living in a 3 story, 4 bedroom, full unfinished basement rental home. We have one room just full of junk and a basement with a fair amount of junk in it as well. 1.5 years ago, we moved into a smaller house–2 bedroom, one store home. The garage was overflowing with stuff even after our dozens and dozens of boxes and bags of trash and unneeded “treasures” that were thrown out and given away before our move in. About 6 months ago, we moved to a new state, before we moved, we got rid of about half to three-fourths of the stuff in the garage. We were able to fit everything we owned (no living room furniture) into a 16 ft. truck. At the end, we were throwing stuff anywhere it would fit. We have some things we thought about taking but, ended up not and it was a good thing–we had NO ROOM ANYWHERE. The truck seats were full. The trunk of the car (the one that could fit 5-6 bodies, if needed) was stuffed. Front seat of the car and floorboards were stuffed. Now, here we are–6 months later and I am still finding stuff that I need to get rid of. I am almost ashamed to say it. But, I am not, because we have done amazingly getting rid of everything. As a result of knowing I need to get reorganized–especially before another move in 6 months–I started the 40 Bags in 40 Days Challenge. I joined the Facebook group and dove right in. I started with the list . Since we’re living with family, some of these don’t apply–our kitchen stuff is still packed up so, I can’t downsize that, at the moment, (not until we get to the garage). 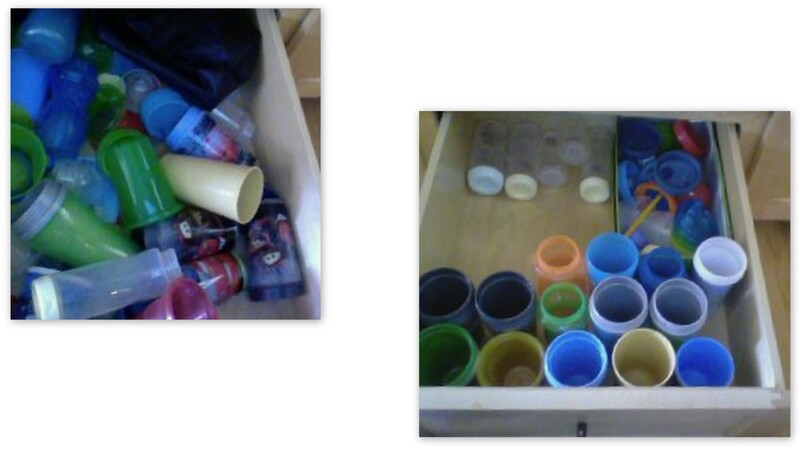 But, the one spot we do have stuff in the kitchen, I got all tidied and made it easier to find things. 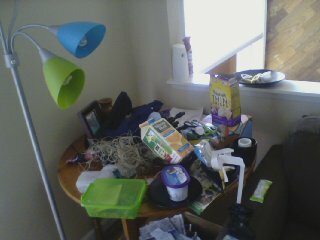 Plus, I have already started cleaning and organizing so, some areas are already done. 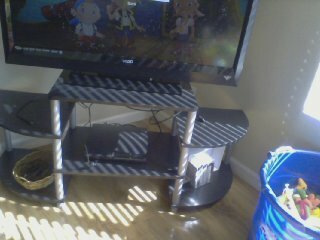 Such as, our entertainment center in the living room. But, other areas need to be retouched–the little toy storage in the living room that we do have; the side table in the living room; the mantle that is overflowing with knick-knacks and things I probably don’t need or can pack away because the holiday is over. As I am looking at it, there are 7 pictures, a vase of dead flowers (my birthday last month), a spray can of air freshener, a jar of 2013 moments–because I wanted to be cool (so not that type of family, TRASH), some of the boys odds and ends, a bowl full of the first flowers my husband ever gave me, some jars that I decorated from an idea on Pinterest (dang you! ), and an empty candle holder that needs to go in the freezer so I can clean it out. The mantle, toy storage, the bar behind the couch, and the table in the living room will be my projects for now–whether it’s the next hour, the next 5 minutes, the next couple of days–they will be what I will get done so that I can say that our living room is all done. 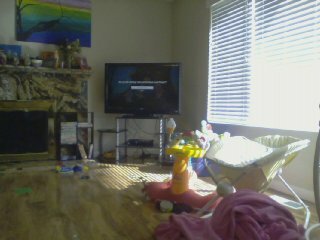 Horrific table in the living room. So, here’s to 1 Day, 1 Bag of the 40 Bags in 40 Days.